On April 7th, 2017, we had the pleasure of attending #HitchedMTL in its inaugural year to witness Montreal’s talented industry experts put together three mock weddings for a select number of newly-engaged couples. Thanks to Studio Baron Photo, Danylö Böbyk Photography and Emilie Olson Photography every moment from the fresh and innovative event was captured start to finish. Designed by Baccino Events, Bravo Rentals and Deka Events, #HitchedMTL featured three setups—rustic, traditional and modern—showing couples exactly what goes on behind the scenes of a wedding. To ensure they were qualified new couples on the hunt for quality vendors, attendees were selected based on an application and screening process. 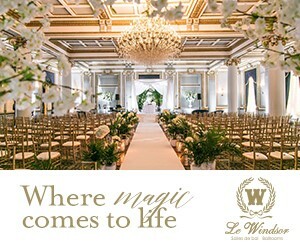 Parc Jean Drapeau’s La Pavillon de la Jamaique and La Toundra served as the venue where all profits were donated to the Montreal Children’s Hospital Foundation and every guest received a complimentary copy of Elegant Wedding Magazine. Congratulations to all the talented vendors who threw together such a successful event! Follow #HitchedMTL on Facebook, Instagram and Twitter! Photography: Emilie Olson Photography | Planning & Coordination: Baccino Events | Tuxedo: Classy Tuxedos | Rentals: Bravo Location Rentals | Stationery: White willow paper co. | Flowers: Elvira Louka | Cake: Blüming Cakes by Anggie Wong | Dress: Boutique de Mariage Punta Chiara | Jewellery: La Forge d’or | Makeup & Hair: Ally Zwonok I Beauty Couture | Spray Tan: T.A.N.